If you stick to CrossFit long enough, you will inevitably find your rival. It begins with one person who, through direct competition or scrutinizing the board, is your equal in almost every way and whose times, weights, and performances are almost always within seconds, pounds, or points of yours. And where they’re not your equal, if they’re stronger or faster in weightlifting, you’ve most certainly got them in running or gymnastics, and vice versa. Finding this person is an essential part of increasing your fitness and, if sustained over months and years, your health. But aside from helping you increase work capacity, and perhaps more significant, is that in your rival you will find not only healthy, essential competition, but also rock solid support, and in a few cases, great friendship. Over time, you may even find more than one. 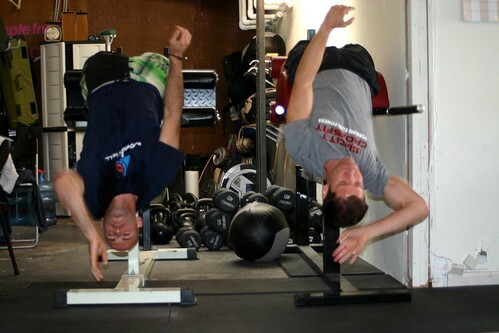 Mine is without a doubt Sean Milar of Valley CrossFit. Some of you may have met him on Sunday morning WODs. We met in 1995 and were competitive in every athletic way – cadets, swimming, running, weights, calisthenics, gymnastics. Ten years later, he and another buddy introduced me to CrossFit. We text PRs and times to each other to this day. Indeed, one of the greatest WODs I’ve ever done was in the four person weight room at the old CrossFitLA. It was myself, Traver Boehm, Leo Bishina, and Kevin Daly, each man better than the next, drooling and hefting through a nasty double under/squat clean/ring dip triplet. It was unforgettable, sacred, powerful. It is for this reason in fact, that I decided on competing at Sectionals: the honor of sharing the field with my rivals and brothers and friends. Have you found yours? If so, cherish them, and call them out. In comments, let us know who they are, how much you appreciate them, and how much you look foward to kicking their a$$!